Whether it’s for work, school, the gym or anything else, an everyday carry (EDC) backpack is a must have. It allows you to conveniently and securely carry everything you need for a day, and these bags can often double as travel or hiking/camping bags. But with so many different bags on the market, finding the best EDC backpack is a challenge. It’s easy to spend a lot of money on something that doesn’t meet your needs or that will break on you in just a few months. We don’t want this to happen to you, so we put in the time to make sure it doesn’t. We’ve read hundreds of reviews and compared countless options using our rigorous methodology. This has led us to the Mardingtop Tactical Backpack—the best EDC backpack on today’s market. 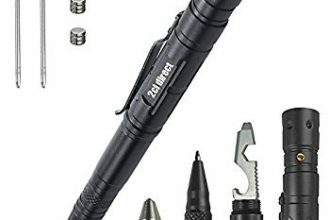 It’s got plenty of space, it’s made from durable, water-resistant nylon, it has plenty of convenient storage compartments, and it is not too expensive. To get the best EDC backpack for your money, buy the Mardingtop Tactical Backpack now. We live and breathe all things tactical. As avid hikers, campers and hunters, we love having the right gear for the right situation. But some time ago, a few of us, at least me, realized that we loved our gear so much we wanted to use it for more than just being outdoors. Some of this stuff, especially backpacks, have so many great features, and are made so well, they deserve to be used more often. This is where the EDC backpack comes in. We use this stuff all the time because we love it and believe in it—we wouldn’t recommend anything we wouldn’t use ourselves. But our passion for tactical gear isn’t the only reasons you can rely on our reviews. We have developed a rigorous and effective testing methodology to be able to sort through the various options on the market. It involves hundreds of hours of reading reviews, comparing specifications and testing products. This allows us to eliminate the junk and focus only on the good stuff. And it leads us straight to the best products on the market, which we then recommend to you. EDC stands for everyday carry. Pretty simple, no? Most of us use some sort of a bag, so you might be wondering why you need to have the best EDC backpack. It might seem like any old bag would do the trick. Well, this isn’t quite true. First, there is a health issue to consider. Most of us do not take good enough care of our backs, something we come to regret later in life. Even if your bag only weighs a few pounds, it is important to have something that properly disperses the weight so that you do not strain your back too much. Another reason to look for the best EDC backpack you can find is organization. We’ve all had those moments where we are digging through our bags looking for our keys or a pen. These moments are frustrating to say the least. Good EDC bags will have lots of different pockets and compartments so that you can keep everything within arm’s reach. But one of the most important reasons for having a high-quality EDC backpack is safety. Because these bags allow you to carry lots of different things with you, you can keep some useful gadgets with you at all times. Perhaps you may need a knife, compass, GPS or even a concealed firearm. 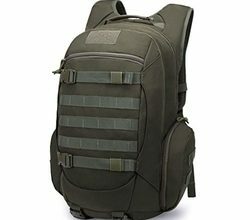 A tactical-style EDC backpack will help you keep these things with you in an organized fashion so that you can get to them at a moment’s notice. The first step in our review process is always to read what others are saying. We eliminate any options that are negatively received by other consumers. Then, we use a detailed set of criteria to compare specifications, throwing out any that do not meet our expectations. The last step is to test some of these products ourselves, and this leads us straight to the best EDC backpack. One of the first things to consider when looking for the best EDC backpack for you is size. You need to keep in mind that this is the bag you will be carrying with you all the time. Buying something big and bulky is not the way to go. It will only weigh you down. On the other hand, you want to make sure it is big enough to accommodate you. Will you be carrying a laptop? Do you want to fit gym equipment? Unlike other types of backpacks, we find it is better to find something a little bigger than you might be expecting for an EDC bag. 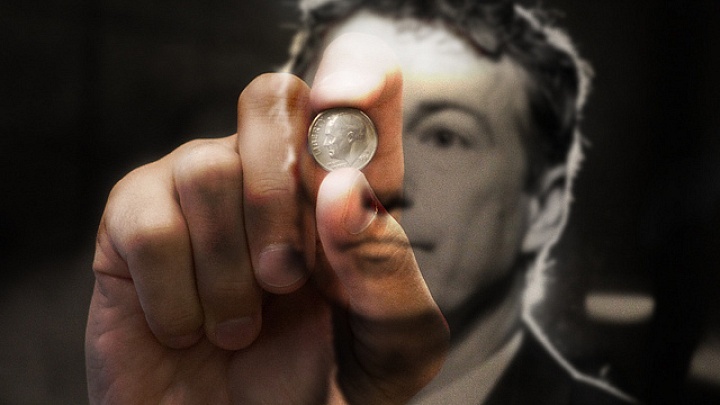 This is because you want to have the option to carry more. While your typical load might not include much more than a computer, some books and a water bottle, you want to be able to use the same bag on the days where you need to throw in a change of clothes or some extra gear. Something around 30 liters is a pretty good size for an EDC bag. The material from which your bag is made is another major factor to consider. You want something that will protect the stuff inside and that will withstand constant use. Another thing to look at is stitch quality. While you won’t be carrying a ton of weight, you want to know that the bag will not rip on you after just a short period of time. Nylon is a great option for these types of bags, particularly because it is usually water resistant or waterproof. Another good choice is polyester, although this is often not able to protect against water, unless it’s a particularly high-grade polyester. A new trend in EDC bags is the single strap “sling” bag. These things look great, and they are quite convenient. You can easily move the bag from your back to your front, in the event you need to access something or want to hold you bag closer (something you might do on the subway). But you need to be careful with these bags, as they can be worse for your back and shoulders. They may look really cool, but if they aren’t designed right, they will put unnecessary strain on your body. Because of this, we consider the traditional two-strap bag to be a bit better. But there are some great sling bags out there, which we will talk about later. Another obvious thing to consider when looking at EDC bags is its compartments and features. This is what really sets a backpack apart from competitors. You want to have at least two or three different compartments, and it’s really helpful when these have sleeves or pockets inside to help you organize your stuff. Some bags will offer special places to store laptops or phones, and others will come outfitted for hydration packs or headphones. Think about what it is you will need and you will likely find a bag that works for you. The first thing we do in any of our products test is to read the reviews left by others. Typically, we throw out any product with less than a 3.5-star rating on Amazon. We read through the different opinions, and usually a rating this low comes from consistently bad performance. We don’t count disgruntled customers’ opinions as particularly valid. 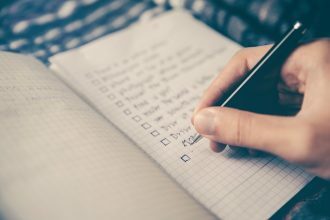 This first step helps us narrow our list. Then, we begin to compare the products based on their specifications and the criteria we mentioned above. After this, we were left with ten different bags, which we tested ourselves. When we were done, we were left with the best EDC backpack. To begin cutting our list down, we started eliminating bags because of their size. We mentioned earlier how it is better to have a bag a bit bigger than you might be expecting. This allows your bag to be more versatile. But some of the top options on the market are simply too small. They are either designed as not much more than laptop bags, or they can’t fit much more than a few small items. Some of the bags we threw out because they were too small include the 3V Gear Posse Tactical Sling Pack, the eBags Professional Slim Laptop and the TravTac Stage II Small Sling Bag. The next thing we did to try and make our list smaller was to eliminate some options based on their design. As we said earlier, the best EDC backpack will feature a combination of comfort and the convenience/storage capacity of a good tactical bag. Because of this, we want the bag we recommend to go above and beyond a typical backpack. We look for bags with unique storage compartments, customizable MOLLE design and other organizing features. We threw out quite a few bags because they didn’t meet our design expectations. 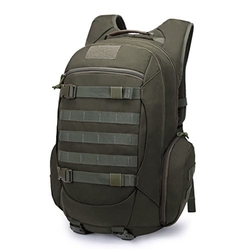 Some examples include the G4Free Outdoor Tactical Backpack, the 5.11 Covrt18 Backpack and the Vertx EDC Ready Bag. 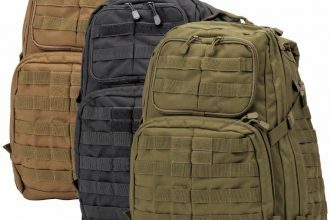 The Mardingtop Tactical Backpack combines nearly everything we were looking for in the best EDC backpack. It’s got plenty of space and interesting storage features, it’s made from durable, water-resistant 600D polyester, it’s not too expensive and it is comfortable to wear. Probably the first thing that stands out about this backpack is how comfortable it is. The back of the bag and the shoulder pads are nicely padded so that even with a heavy load the bag sits well. Plus, it comes with both hip and sternum straps, meaning you can increase the support to your back when carrying a lot of gear. The other thing that sets this bag apart as the best EDC backpack is its design. It has one large compartment in the back and several smaller ones throughout, including two side pouches you can use for storing a phone, camera or any other small item. The smaller front pouch has several sleeves to help you organize your stuff. And the bigger pouch also includes a separator where you could store a laptop if you wanted. 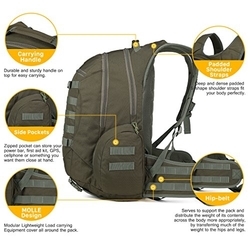 This bag also features the MOLLE hanging system, which allows you to easily add more pockets and pouches as you see fit. It is also a very durable bag that will keep your stuff well protected. Made from 600D polyester, it is water resistant and tough. It held up quite nicely to our wear and tear test where we loaded it with heavy gear and hung it from different straps and handles. Another nice feature is that this bag is outfitted for a hydration pack. While this may not be totally necessary for everyday use, it certainly helps make the bag more versatile. The bag also comes in a variety of styles. You can get a solid black or green, or you can opt for a camo design to have the bag look more tactical. Lastly, retail price is under $50, making it a tremendous value for the money. You’ll get all you need in an EDC backpack without breaking the bank. The 600D polyester on this bag makes it water resistant, but it is not waterproof. 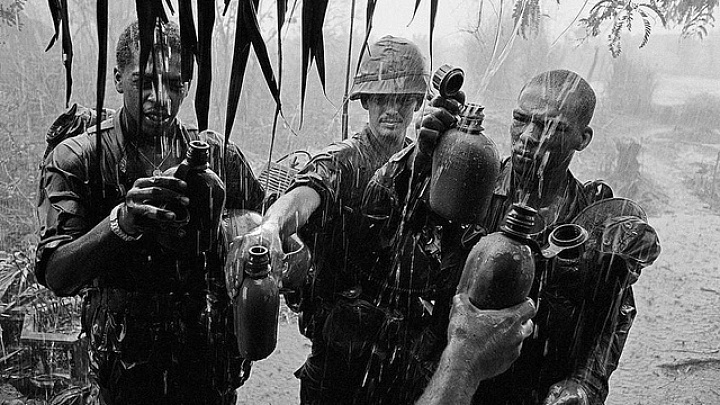 This shouldn’t be a huge issue, but if you were ever to get caught in a big rainstorm, the stuff inside your bag will get wet. But you usually don’t find full waterproofing on EDC bags. This is something saved for tactical-specific backpacks. Also, we would have liked to have seen one more small compartment in the front. The MOLLE system is great, but the way the bag is set up, the front pouch is a bit deep. A smaller pocket in the front would have helped make go-to items a bit more accessible. But this doesn’t take too much away from the bag. For some people, an EDC backpack should be something smaller and easier to just throw over your shoulder. Satchels and messenger bags work great for this, but an option that is a bit easier for your back and shoulders is a sling pack. The Red Rock Outdoor Gear Rover Sling Pack is the best of this particular option on the market. It’s comfortable, versatile, spacious and affordable. The sling is designed quite well. You can switch between carrying it in front or behind you rather easily. And it is also designed for both lefties and righties, so you don’t need to worry about awkward carrying positions. When carrying a lighter load, this bag is really quite comfortable. Also, despite being a bit small, this bag can fit a lot of stuff. You may be surprised at first as to how much you can get in. And it’s high build quality means you can stuff it to the brim and not worry about breaking seams or stitches. There are three main compartments, and each one has its own set of zippered pockets or sleeves. This makes it easy to keep things organized in such a small space. 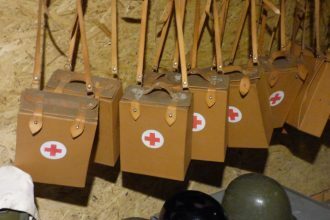 The bag is also equipped with the MOLLE hanging system so that you can customize it to have more space if you want. Another nice feature is that the bag, which is made from 600D polyester, is water resistant. This will offer some protection against any water exposure. The bag also comes in several designs so that you can find something that matches your personal and/or professional tastes. And all of this comes for less than $30, making it a fantastic value. One issue with this bag is its size. While you can certainly fit a lot in, you might have trouble with some more rigid items, such as a laptop. This bag really isn’t designed to carry a computer. Some people may have an issue with this. Also, the 600D polyester is water resistant but not waterproof, so your stuff will stay protected, but not forever. Lastly, while the sling design is convenient and useful, it isn’t as good as having two straps. It doesn’t disperse the weight in the same way, and this makes it harder to carry more stuff. If you are just bringing a few things with you to the gym or on a hike, you won’t have a problem. But if you are looking to pack stuff in, you may suffer down the road. If you are looking for a small, convenient and versatile sling pack for your EDC backpack, then get the Red Rock Outdoor Gear Rover Sling Pack now. Having the best EDC backpack you can get will certainly make your life easier, but finding that bag can be quite difficult. To help you get something you will like and that will meet your needs, we did the work for you. We used our proven testing methodology to help narrow down the options and find the best. By reading hundreds of reviews, comparing countless specifications and testing out bags ourselves, we have deemed the Mardington Tactical Backpack to be the best EDC backpack on the market. It is comfortable, spacious, versatile, durable and affordable. 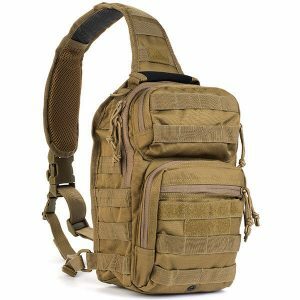 To get this fantastic backpack and take advantage of all it has to offer, buy the Mardingtop Tactical Backpack now. Is Restraint a Realistic Grand Strategy?